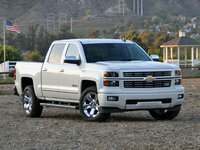 CarGurus has 35,775 nationwide Silverado 2500HD listings starting at $2,250. In the ultra-competitive full-size pickup market, power, payload, passenger perks and plain old trailering capacity just keep getting more impressive. A facelift here and some added perks there don’t hurt either, and that’s where the reworked 2015 Chevrolet Silverado 2500HD steps forward. The beneficiary of some well-received tweaks to the lighter-duty 1500 lineup, this reworked heavy hauler sports some notable styling changes outside and inside, with a few additions to comfort, convenience and safety bling also expected. And the big news for this year's edition: A new 4-door, 6-passenger Double Cab trim joins the team as well, fitting between the holdover 3-seat Regular cab and the 6-passenger Crew Cab offerings from last year’s lineup. Further, the new Double Cab trim sports forward-opening rear doors that make entry and exit, not to mention packing groceries in the cab, a lot easier in crowded parking lots. Trim levels still run from the base WT (Work Truck) and midlevel LT in all 3 cab configurations to the top-shelf LTZ that comes in just Double Cab and Crew Cab iterations. A pair of bed lengths, the 6 foot, 6 inch standard bed and the 8 foot long bed remain available to Double Cab and Crew Cab versions, with Regular Cab iterations coming only with the long bed. Added features for all 2015 Silverado 2500HDs also include a standard 4.2-inch driver information display, while an 8-inch infotainment touchscreen display that boasts upgraded MyLink capability comes standard in the LTZ and is available as an option in the LT. Larger knobs and buttons (for work-gloved hands), new optional safety alerts and warnings, a quieter cabin, redesigned seats and new cargo hooks all debut in this latest Chevy heavy. 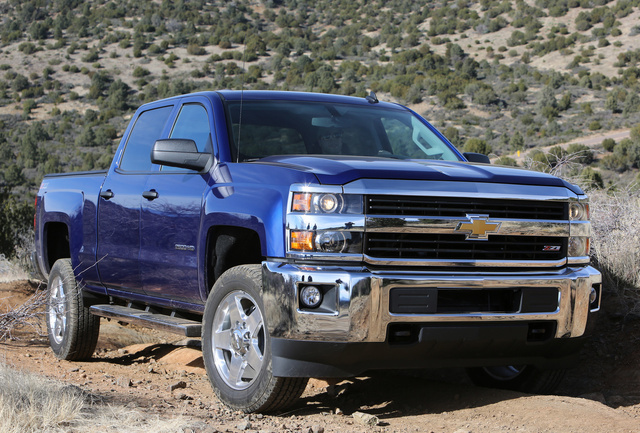 One thing that hasn’t changed for the 2015 edition of the Silverado 2500HD is the standard powerplant, which remains a Flex Fuel (ethanol-capable) 6.0-liter V8. Mated with the 6-speed heavy-duty automatic transmission, this hefty V8 puts out 360 hp and 380 lb-ft of torque. As is traditional with heavy-duty pickup engines, mileage figures are unavailable, but towing remains maxed out at 13,000 pounds with the proper equipment. Again, a Compressed Natural Gas (CNG) version of this engine remains available, though with a significant loss of power. Also in a return gig, the potent Duramax 6.6-liter turbodiesel V8 remains available to all Silverado 2500HD trims and once more comes under the management of a 6-speed Allison 1000 auto/manual transmission. Look for 397 hp and a whopping 765 lb-ft of torque out of this blown diesel V8, along with some 17,900 pounds of fifth-wheel hauling capability. Again, a standard exhaust brake comes with the turbodiesel, while both drivetrains flaunt a standard trailer sway controller. Of course, this big rig returns packing standard rear-wheel drive (RWD), but fear not, all versions still remain available with off-road-capable part-time 4-wheel drive (4WD) featuring hi-lo gear selection, a locking rear differential and auto-locking hubs. Standard appearance doodads in the spiffed-up Silverado 2500HD include, depending on the trim level selected, 17- or 18-inch alloy wheels, a trailer hitch and wiring, cloth or leather-trimmed upholstery, full power accessories, cruise control and telescoping tilt-wheel steering. Manual air conditioning graces lower trims, while the LTZ boasts standard front climate control, with such upgrades as the EZ-Lift tailgate, OnStar Directions and Connections technology and Bluetooth hands-free calling both standard in LT and LTZ variations. Entertainment, meantime, runs the gamut from a simple AM/FM stereo setup with 4 speakers in the base WT Regular Cab to a 6-speaker ensemble with single-CD changer and satellite radio installed in the LT and LTZ trim levels. The LTZ also sports the aforementioned brand-new 8-inch infotainment screen that supports GM’s updated MyLink smartphone apps. The LTZ also packs standard remote engine start, a rear-view camera, heated front seats, a remote garage door opener and an auto-dimming rear-view mirror as standard equipment. Options, again trim-level-dependent, include the Z71 Appearance Off-Road Package, a spray-in bed liner, upgraded and upsized wheels, tubular sidesteps, an integrated trailer brake controller, beefed-up axle ratios, a 7-speaker Bose premium stereo upgrade and a hard-drive-based navigation system. Safety-wise, in addition to the usual antilock braking (ABS), stability control and the conventional side-mounted and head airbags, the new-look Silverado 2500 HD in LTZ garb can also be delivered with a brand-new optional Driver Alert Package sporting forward-collision warning, lane-departure alerts and a safety alert driver’s seat. Further standard safety equipment throughout the lineup includes daytime running lights, while the LT and LTZ boast standard OnStar emergency assistance communications and alerts that are optional in the WT. Finally, the theft-deterrent technology that’s standard in the LTZ remains optional for the LT.
What's your take on the 2015 Chevrolet Silverado 2500HD? Donaldsilverado Just took delivery of a new LTZ and I am really impressed.Traded a 2002 duramax and can't believe the difference. Looking forward to a long and happy relationship with my new truck. 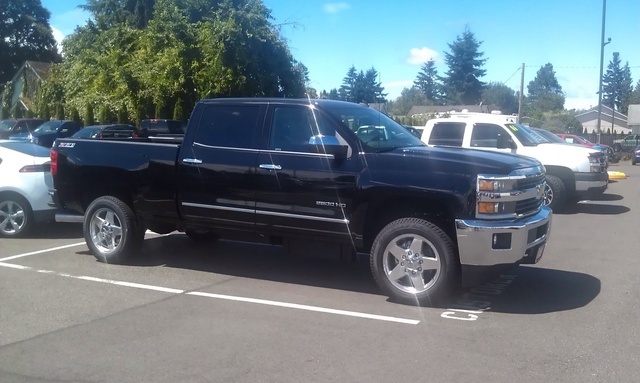 Have you driven a 2015 Chevrolet Silverado 2500HD? After truck is shut off hear a noise under truck running (sounds like a fan of some type). No keys in Truck still going - What could this be? Im looking at buying a 2015 2500 hd chevy, with 66,000 miles. It had a new transmission put in last year, why would a 2015 need new transmission already? Would you still buy it?